Gardner's Photographic Sketch Book of the War. Plate 23. 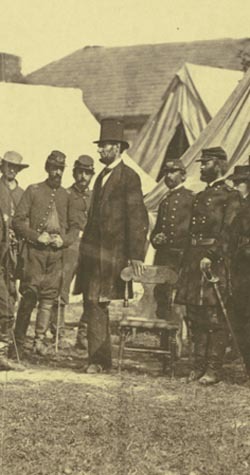 President Lincoln on the Battlefield of Antietam. Scouts and Guides to the Army of the Potomac. Medical Supply Boat at the Landing. On Saturday, the President set out on his return home, accompanied by General McClellan as far as Middletown, but on the way, riding over the battle-field of South Mountain, the leading incidents of which, the scenes of particularly desperate conflicts, the names of the Corps and officers engaged, &c., were pointed out and described by the General, as he had previously done those of the great battle of Antietam; in all of which the President evinced a deep interest. The President then proceeded to Frederick, where he was received by the people with the most enthusiastic demonstrations of respect, and reached Washington in a special train at ten o’clock at night. President Lincoln on Battle-Field of Antietam, October, 1862. Albumen print photograph by Alexander Gardner.